Diffusion in acoustics is the efficiency by which sound energy is spread evenly in a given room. A perfectly diffusive room always sounds great in any part of the room. A non-diffusive room has considerably different reverberation time as the listener moved around the room. Small rooms generally have very poor diffusion characteristics at low frequencies due to room modes and acoustic diffusors are great at fixing this. Acoustic Sound diffusers are designed to scatter or disperse sound waves, thereby reducing standing waves and echoes to improve sound clarity. 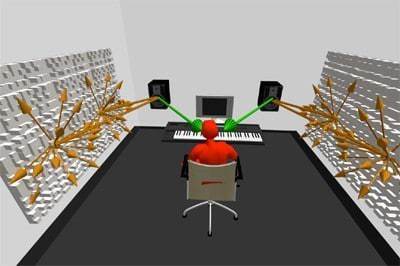 Diffusers (or Diffusors) are typically used in critical listening environments like recording studios, control rooms, music production and live music rooms. Unlike sound absorbers that trap or eliminate the sound, acoustic diffusors maintain the “live” ambience, while at the same time reducing standing waves and slap echo. Diffusers may be manufactured from moulded plastic, wood, or even acoustic foam and may be wrapped or covered in various fabrics. Sound diffusers are often used in combination with other materials such as sound absorbers, bass traps, ceiling clouds or other provisions to achieve the desired results for the acoustical space.